Picture frames can be purchased at a store or made specifically for a certain size picture or photo, such as an 8 x 10. However, if you cannot find the type of frame you need or the correct size, you can make a custom frame from trim pieces and tools you may have in your workshop or garage. Apply a bead of wood glue to the back of one piece of trim. Place the back of a second piece against the first and leave a 1/4-inch gap at the bottom to create a rabbet. Hold the pieces of trim together with the clamp and wait at least 12 hours for the glue to dry. Measure each piece of trim with the tape measure. Make a mark with the pencil to indicate the length for each piece. Cut the pieces to the required length with the circular saw. Cut a 45-degree angle into the corner of each piece of trim with the miter saw. Apply wood glue to each end of the cut pieces of trim. Join the corners together and wait for the wood glue to dry. Wipe off any excess glue with the cloth. 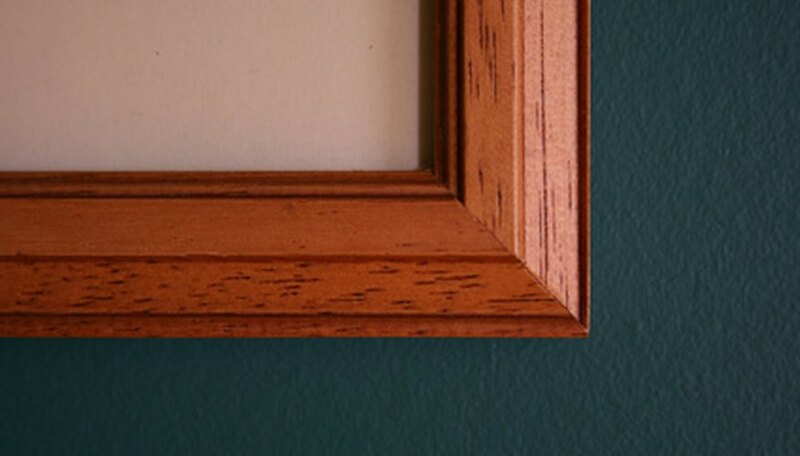 Drill a hole into each corner of the frame with the power drill. Drive a finish nail into each hole with the nail gun. Prime and then paint the finished picture frame with the paintbrush to complete the project. A rabbet is the gap or edge of wood that is created when the two pieces of trim are glued together. The rabbet will be used to support the picture and glass in the completed frame. Picture Frames: What Is a Rabbet?